Milan: Interno, Giallo: Mondadori, 1994. 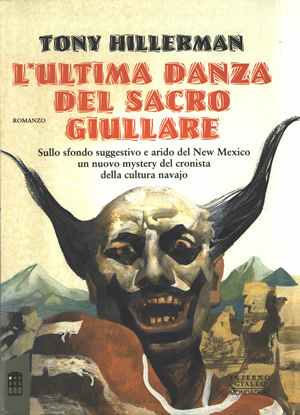 This is the first Italian edition of Tony Hillerman's 1993 novel Sacred Clowns. The cover art on the dust jacket is a fanciful synthesis between a traditional Euro-American circus clown and a Hopi clown kachina. Binding: Silver paper-colored boards with the author's name and title of the novel printed horizontally in white along the spine, with the publisher's logo printed in black and white at the bottom.